Fig. 7. 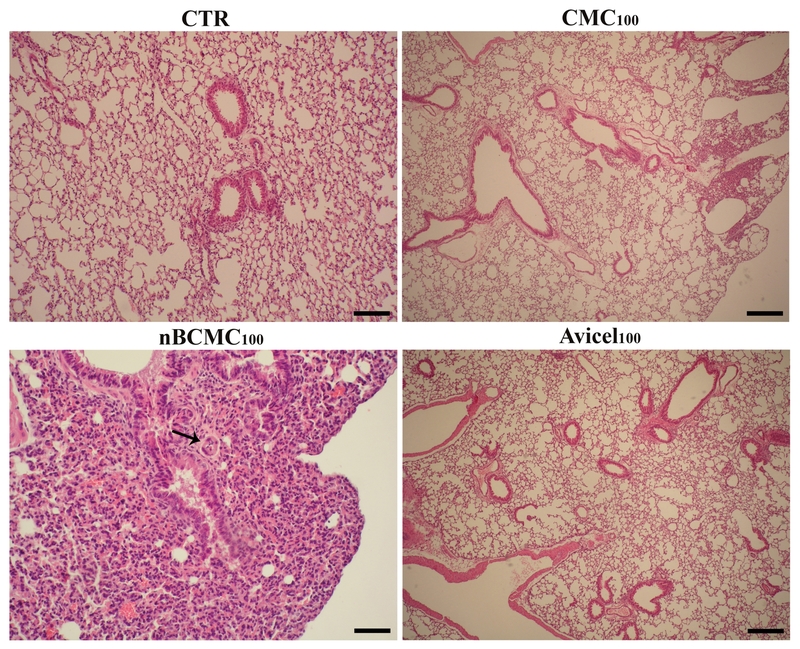 Mice lung sections after CMC100, nBCMC100 and Avicel100 treatments during 3 months (40x magnification, scale bar = 200 μm). CMC100 and Avicel100 groups presented mild diffuse degeneration of terminal bronchioles and mild multifocal chronic bronchioloalveolar inflammation, composed of macrophages, lymphocytes and plasma cells, whereas nBCMC100 group showed moderate diffuse degeneration of terminal bronchioles, moderate multifocal to coalescing chronic bronchioloalveolar inflammation, with higher numbers of infiltrating leukocytes and also multifocal medial hypertrophy of pulmonary arteries (marked with an arrow). Control groups presented normal lung histology.